← Why is Jane Austen immortal? OMG! Rita, the pictures are lovely. It added so much to what you were telling us. I was so excited to see the authors you met… and then, you were able to travel with them… what fun. Thank you for sharing with us. Have a blessed day and hopefully you can make it to Gaskell’s house next time. Thank you Jeanne 🙂 It was really a priviledge to be spend so much time with these authors and to learn from them. I also met some readers with whom I usually talk on this blog and I have to say that it was one of the highlights of the trip! I wouldn’t mind meeting all of you 🙂 Can you imagine a gathering with all of us? We would talk for hours! What a perfect ending for your road trip. The quote on the ten pound note was taken out of context and, and it does bother me; however, Jane Austen would probably see much irony in it. Miss Bingley continues to try to be noticed! I am sure the service at Winchester Cathedral was moving. Thank you for the giveaway, and I look forward to future postings. Oh how I wish I could have been there with you all, both in the North and in Winchester! As things happened, though, I had to endure my busiest working week of the whole year so far. To make things worse, on the 18th the place I was working in had no mobile phone or data signal so I couldn’t even keep up with the events in my breaks. It had to wait till I got home to catch up with the news and to start reading all of the lovely blog posts that are appearing, just like yours Rita. Thanks so much for sharing all of your lovely photos with us and for writing such a beautiful post. I already have my own £2 coin, bought direct from the Royal Mint in a special presentation pack. It cost quite a bit more than it’s face value though! I’m looking forward to getting my hands on the £10 note in September. Given the nature of my work, in community pharmacies where money is handled daily, I’ll be seeing Jane just about every day once the notes enter general circulation. Regarding the quote they chose for the note, I can understand why some people are complaining as Miss Bingley didn’t mean what she was saying, just trying to attract Darcy’s attention but as a quote from an author about reading, I think it’s pretty good. Many of the alternative quotes suggested wouldn’t have fitted into the space allotted on the note. Please don’t enter me in the giveaway as I’m planning my own trip to Hampshire at the end of next month. An unexpected change in my work schedule has given me enough time to make the trip from Yorkshire and to spend three full days visiting and revisiting places associated with Miss Austen. I even have my own lavender bag sitting on the bookcase in my study! Looking forward to the forthcoming posts about your trip. But 3 days in Hampshire will be more than enough compensation, I’m sure!! I hope you have lots of fun and that you share pictures and stories with us too. I wouldn’t mind having one entire month to travel across all the Jane Austen related places… But who would, right? Oh yes, please do let me know when you’re going to be over here, Rita. Especially if you’re paying another visit to Lyme. It’s only two hours drive away from me! I had hoped to join you and Lory and the others when you were there but we had pre-existing plans that couldn’t be changed on the Sunday and I was working on the Monday. I’m really enjoying your posts and photos Rita. It was such a pleasure to meet you along with Lory, Ellen and Andreea. I usually struggle meeting people I don’t know personally but with you it was just like meeting old friends and I had a wonderful evening. I couldn’t go to Winchester so it is especially great to share your experiences there. What a wonderful post, Rita! Thank you for sharing with us all the details! I look forward to going to England and doing all these Jane Austen things! About the quote in the note, I would probably have preferred if it was a quote from Elizabeth Bennet or Darcy and not Miss Bingley but it doesn’t bother me that much. I’ve really enjoyed reading your post on this fantastic experience. Thanks for sharing all these photos, too. As for the quote, anything from Jane’s pen would be fine with me! A road trip I would love to take myself. Thank you for sharing. Oh how I would love to go and visit some of the places you have! 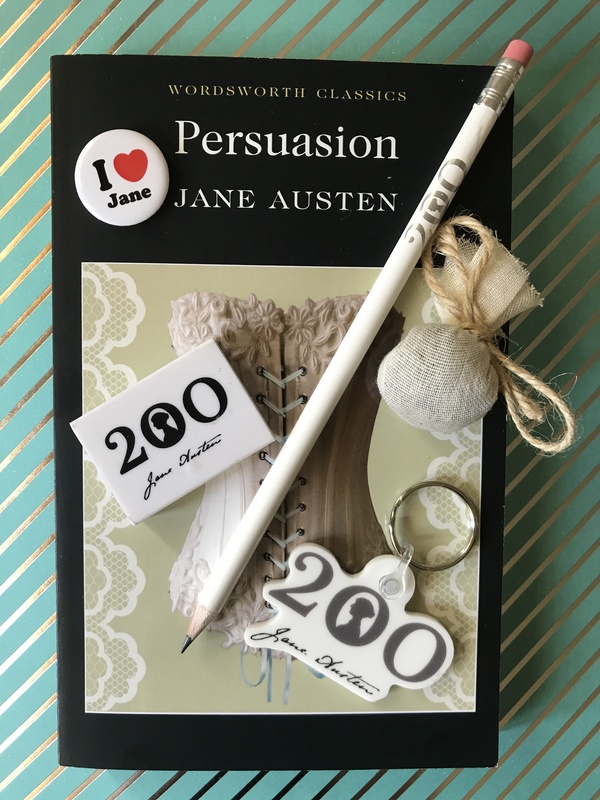 Thank you and all the authors for keeping Jane Austen’s writing alive with your books! What a fantastic trip you have made!! So wonderful to feel a small part of it by this post 🙂 It really must have been a dream come true. So wish to go there one day myself. To walk where Jane has been, to see the special places… Heavenly I imagine! What a wonderful way to commemorate Jane’s death than by attending a service in Winchester Cathedral with friends. And to think that Jane will be further commemorated by placing her image on the £10 is really quite unique! I’m glad a lovely time was had by all. Your photos are so precious! The pictures are lovely. Thank you so much for sharing your thoughts and impressions of this wonderful event. Even though Caroline is quoted I think it is a good choice. I am fortunate to have the £2 coin in the presentation pack. I am looking forward to, one day, visiting some of the places you have been to. Thank you for the generous giveaway. Thank you Debora, the coin is also very beautiful isn’t it? I really enjoyed reading your account of your trip to commemorate to Jane’s death. You are so lucky to have been able to be in England and especially in Winchester at this time. Please don’t enter me in the giveaway, just popping by to say thanks for everything you do and for being such great company and a fabulous friend!! OMG I just realised we haven’t drunk that Darcy champagne!!! Now you’ve GOT to come back! Lovely, heart-felt summary of your special day, Rita! I think including the lavender bag you made on this trip at JAHM is a lovely idea. Great trip you had 🙂 I am glad I was able to see you for a bit! Thank you so much for sharing! Love the pics! Thank you so much for sharing your adventures with us! I love reading about your trips and looking at the photos. I agree with you about the quote from Miss Bingley; regardless of how it was said and the context within the novel, it’s a true quote! Thanks for the giveaway. Thank you for sharing the wonderful experience with us, Rita. It is my fondest wish to visit England some day and visit all the sites that are associated with Jane Austen. I must get my hands on the coin and banknote if I was ever in UK. Unfortunately in coming to read this blog late I find that the photos are missing. But I did enjoy reading about the trip and those you met. Thanks for sharing.